The Tiempo Travel Mobility Scooter is a brand new scooter to the market place, this scooter is lightweight and easy to break down into 4 manageable pieces, it has a delta tiller bar which will enable you to easily hold onto the handle with comfort it will also make the control easier to use. 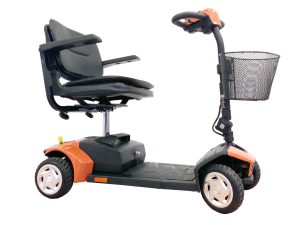 With a good ground clearance of 2.5 ins and large tyres, this mobility scooter will cover a range of about 13 miles depending on the terrain. With a 2 years warranty, your covered for an extra year compared to most other scooters on the market.